Built for Baron Ferdinand de Rothschild (sounds like a great Disney character name, no? ), Waddesdon Manor is beautiful 18thcentury French chateaux located in Buckinghamshire. It is a glorious place to go visit at any time of year with its beautiful Romanesque turrets, paintings by artistic greats (Reynolds, Gainsborough and van Dyck to name a few), precious antique interiors and the fantastic jewellery, ornaments and armour on display. However, in celebration of the festive season, Waddesdon Manor has pushed the boat out with a carnival theme. Not only are colourful lights being projected on the front of the manor reinforcing the impression that it’s a Disney castle, there is now a lovely Christmas market set up in Germanic wooden huts outside selling all sort of lovely gifts to fill those stockings (I recommend the chocolate vodka at one stall). A glorious lights show playfully depicting images related to the history of the house is being projected onto the walls of the stables. Continuing the theme of colourful carnival lights, there is a trail of lights luring you along the paths winding around the aviary gardens. And, the rooms that are still open to the public inside the manor are festively decorated with trees, set up for 18thcentury style Christmas dinner parties as well as some extra fairy tale touches in the corridors. Weekend tickets for entry to the house while it looks so festive are already sold out, so you’ll need to hurry to grab weekday tickets. Luckily tickets to enjoy the grounds and the Christmas market are still available. All that said about hurrying to get tickets, the stand-out treasures were the permanent collection items in the manor itself. 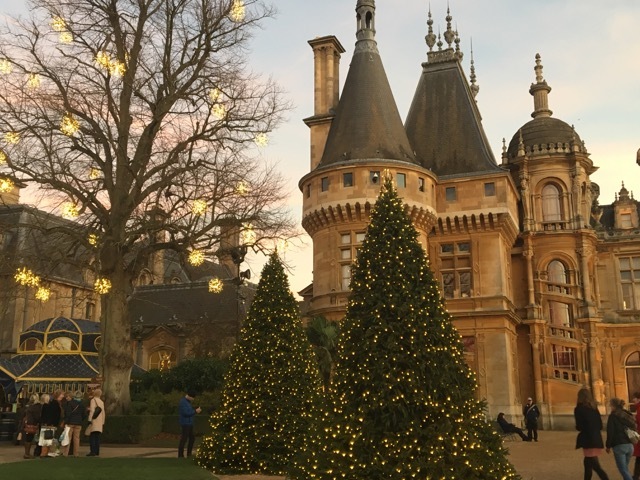 So don’t fear if you can’t get Christmas Carnival tickets – there is still plenty to marvel at at Waddesdon Manor the rest of the year. PS – if you’re coming by train, the nearest station is Aylesbury Vale and buses decked out in the manor’s coat of arms will take you directly to and from the manor!